16-year old Billie Eilish has captivated me every since I heard her debut single Ocean Eyes and it has been a pleasure to see her grow musically. Her most recent singles hostage, when the party’s over and bellyache are on constant rotation here and now she has shared several performances of her show for Vevo LIFT Live Sessions. 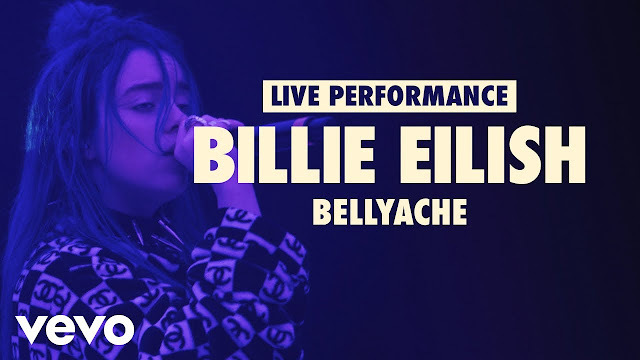 These 3 performances you will check out below, of bellyache, when the party's over and you should see me in a crowd, showcase her incredible vocals and how great a live performer she is. She just made me fall in love with her even more. Check them out below! If these live performances weren't great enough, Billie has also unveiled a stunning new single called come out and play, aspart of Apple's "Share Your Gifts" holiday ad campaign. I am in love with this song! Its gentle guitar notes and her soft vocals are so emotional and give the song a lullaby atmosphere. Check it out below!